Today I have a very special post for you. 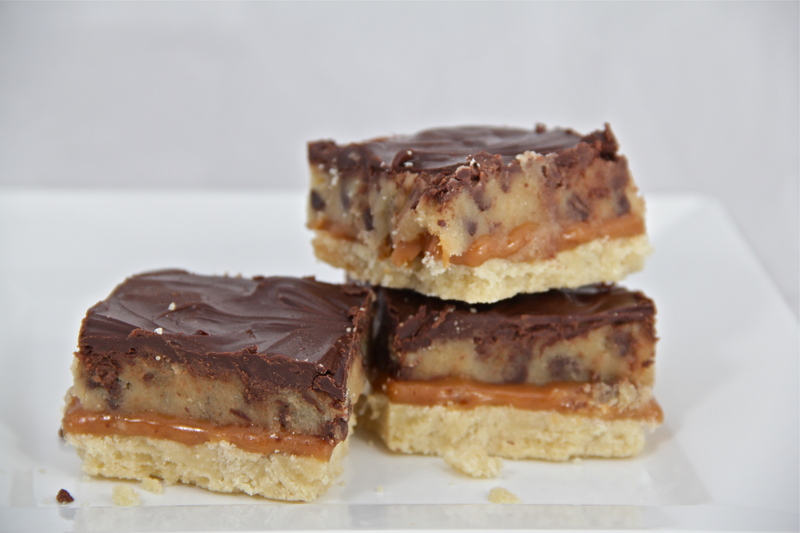 (And no, I’m not talking about fact that these bars contain shortbread, caramel, cookie dough, and chocolate, although that is pretty special.) I’m pleased to report that this is….drumroll please….the 100th post of Emma’s Baking Addiction! Funny enough, it falls almost exactly on my blog’s one-year birthday. Two landmark events for a baking blog equals two excuses to bake two fabulous, over-the-top celebratory treats. First up are these Chocolate Chip Cookie Dough Billionaire Bars, a worthy candidate for my 100th blog post. When I first started thinking about what to make for the big 1-0-0, Millionaire Bars came to mind. 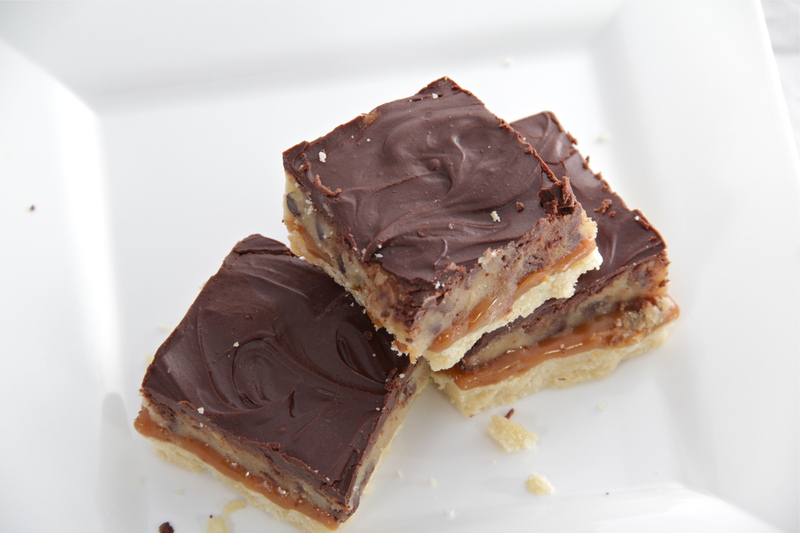 You know, the shortbread-caramel-chocolate layered bars that are very similar to a homemade Twix? That are apparently so good that they make you feel like a million bucks? Or are worth a million dollars? Make you gain a million ounces? Don’t ask me how they were named. I guess it was something about the fact that “one hundred” and “one million” are both numbers that made me think of baking Millionaire Bars to celebrate the 100th post. An obvious connection, right? Right? Maybe-possibly-not-so-much? It made better sense in my head. Anyway, upon looking for a great Millionaire Bar recipe to make as my 100th post (which, as we’ve established, makes total sense) I found the recipe for these babies. Not just Millionaire Bars, these are Billionaire Bars. Which means they’ve gotta be good. 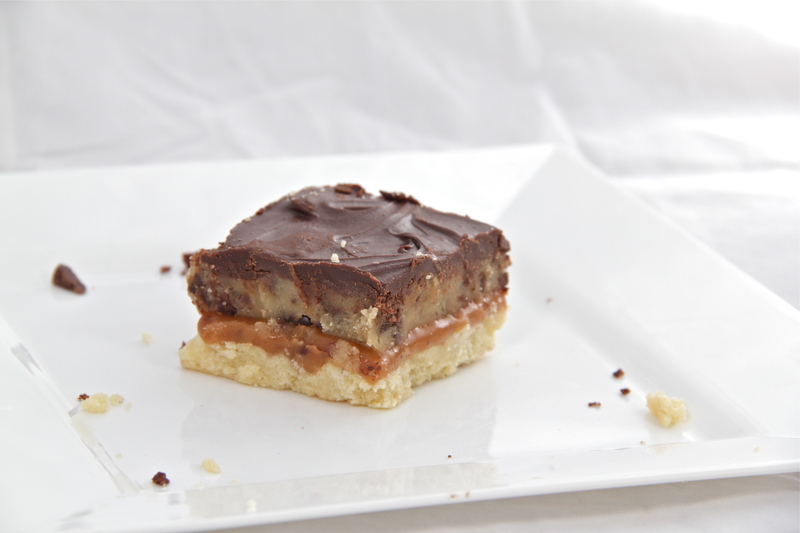 Not only do they have the buttery shortbread, gooey caramel, and decadent chocolate of their lesser-valued cousin, these bars have the brilliant addition of a chocolate chip cookie dough layer. An eggless chocolate chip cookie dough layer, that is, which means it can be eaten raw with absolutely zero worries or frets. Be still, my cookie-dough-loving heart! I hate to say it, but Millionaire Bars have lost a little bit of their luster to me now that I’ve made these Chocolate Chip Cookie Dough Billionaire Bars. It’s not that I wouldn’t satisfied with the original bar, it’s just…a layer of eat-able chocolate chip cookie dough sandwiched between chocolate and caramel? With a shortbread crust, for goodness sake?! Billionaire status indeed. Happy 100th post, little blog! Preheat oven to 350 degrees F. Grease an 8″x8″ glass baking pan and set aside. Make the shortbread: Using an electric mixer, beat together the butter and sugar until light and fluffy, about 2-3 minutes. Beat in the vanilla, then slowly mix in the flour and salt until combined. Mixture will be crumbly. Firmly press the dough into the prepared pan. Poke shallow holes all over the pan using a fork or a toothpick. Bake the shortbread for 18-22 minutes or until edges are lightly browned. Remove from the oven and set on a wire rack. Make the caramel: Place the unwrapped caramels and heavy cream into a small saucepan. Cook over medium heat, stirring constantly, until the caramels are completely melted. Pour the hot caramel over the warm shortbread crust, spreading it evenly. Refrigerate for 30-60 minutes or until the caramel is set. Make the cookie dough: Using an electric mixer, beat together the butter and sugars until light and fluffy, about 2-3 minutes. Beat in the vanilla and heavy cream, scraping down the bowl as needed. Stir in the flour and salt until just combined, then stir in the chocolate chips. 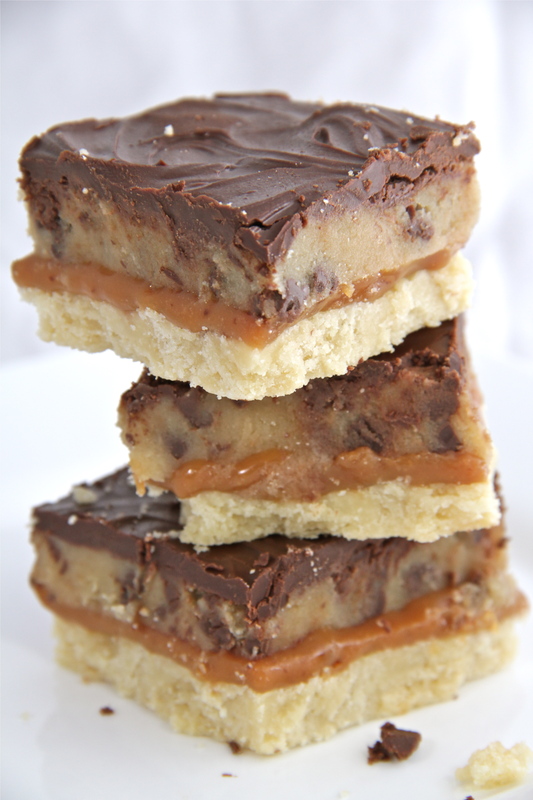 Spoon the cookie dough onto the chilled bars and spread evenly. Refrigerate the bars while making the chocolate layer. Make the chocolate layer: Place the semisweet chocolate and butter into a microwave-safe bowl. Microwave for 30-second increments on 50% power, stirring in between, until chocolate is smooth and melted. Pour the chocolate over the bars, spreading evenly. Refrigerate the bars for an additional 30 minutes or until chocolate is set. Using a sharp knife, cut into bars. The bars can be stored in an airtight container at room temperature for several days.